I found Rob’s review of Fuller’s ESB over on Hopzine really interesting for a number of reasons. Firstly, Rob is a man who really knows his beers, but ESB seemed to have him flummoxed – how could that be the case? I mean, it’s a beer you can buy in most supermarkets and a hundred different Fullers pubs around London, and a beer which many people around the UK know extremely well. I think one reason is that in the pursuit of the next best thing us beer lovers (and I wholeheartedly include myself in that) are sometimes guilty of forgetting ‘the classics’ - beers that have a mighty reputation but which we bypass in the search for something new. This is particularly true of World-famous British beers from the likes of Fullers, which the Americans go crazy over yet many British beer lovers pass by as old-hat. But it’s not just classic British beers we’re guilty of ignoring, it’s anything we’ve become too familiar with. 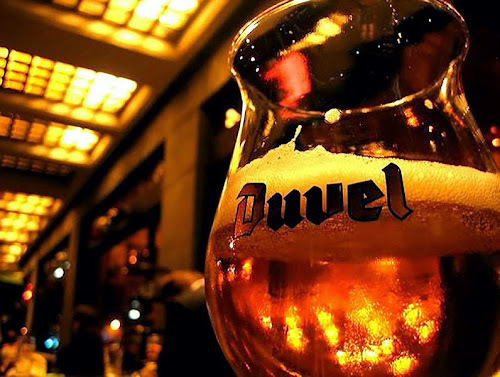 A perfect example of which is Duvel, the Belgian Golden Ale by which all others are judged and a beer with much more complexity than many beer geeks give it credit for. Try it cool, but not fridge-cold, and you’ll be rewarded by heaps of fruity, almost pear-drop-like fruit esters, a creamy malt smoothness and a spicy, yeasty aroma you never new were there. It really is a clever little beer, beautifully clean and drinkable for its abv with a subtlety and class so many beers are lacking. Another example of a style defining beer is Schneider Weisse Tap 7, which whilst it isn’t the earliest weisse bier, it is undoubtably the beer and brewery that kept the style alive when other brewers were abandoning it (middle of the 19th Century) in favour of more ‘modern’ bottom fermenting lagers. Even putting the history aside, Schneider Weisse is, for me, the German style wheat beer against which all others are compared - and a stone cold classic that I return to again and again. But these are much more than beers which have simply stood the test of time. What most people don’t realise is that beers such as this, particularly ESB, define the beer style category* they now sit within. Which in a world of beer as diverse as we live in now, is really something quite special. I think as a beer lover it’s important to check back in on these classic beers, as often you might have forgotten how good they really are - or at the very least be surprised by what you find. *Somewhat ironically Fuller’s ESB doesn’t meet the style guidelines of English Extra Special Bitter according to the Great American Beer Festival, but that’s a whole other blog post in itself. Can't stand ESB, its far too sweet. and Duvel to me tastes like Carling with a shot of vodka in it. Clearly I am a heathen. I'm a big Fullers fan but I blame my mate Martin for me not buying their ESB. There is no beer he slags off more, not sure why but some memory had left him with a bad taste in his mouth (pun intended). You are spot on as a beer drinker and a person who loves find new flavours and experiences I'm on constant search of the bright, new, shiny offerings like a beery magpie. As for ESB, I did start reading my Michael Jackson book to get some kind of understanding before I switched on my camera. I think the thing that both surprised and baffled me was down to the fact you don't see many ESBs around. Stouts, porters, IPA and mild are available in abundance but not ESB. Has the style been forgotten or morphed into something else, has the humble ESB just been re-branded as a premium bitter by Theakstons and a British IPA by Ossett?